Owing to the cooperation between LINK group Foundation and the HRH Crown Prince Alexander Foundation, the top 20 students in the region will attend, free of charge, one-year programs at ITAcademy, where they will acquire skills related to some of the most sought-after professions of today. It is greatly important for these young people to realize what IT is and how important it is to become educated in the field. The future lies in IT – everything is digitalized. I hope these students will have plenty of success and eventually find good employment – said the Crown Prince. In a pleasant setting, over cocktails and casual chatting, both the students and their parents asked the president of LINK group everything they wanted to know about modern education advocated by this company. It has been a pleasure to support these children who have displayed great quality, and proved it by being the best in their generation. I believe they will undoubtedly benefit from the education at ITAcademy, as they are what we call the digital generation. Any IT-related skill or knowledge they will gain is nothing but an additional plus that will help them obtain a pole position at the labor market. In addition, it will help them choose the right school in the near future; although their faculty of choice may be in a different field, IT competencies will add value to their regular education. It is a great honor for us to be a part of the project carried out by the HRH Crown Prince Alexander Foundation, and we believe that the combination of the traditional and the modern is one that guarantees success at all times – said Valentin Kuleto, president of LINK group. 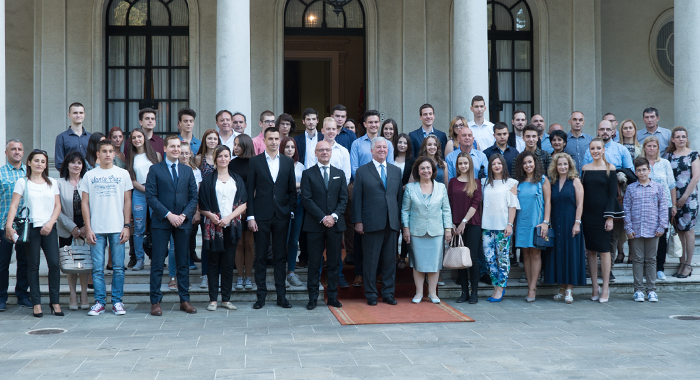 HRH Crown Prince Alexander Karađorđević handed out the scholarships to the best students of their generation. They will attend ITAcademy online, at the program of their choice. Upon completing the program, they will be able to acquire globally recognized certificates, such as Microsoft, Oracle, Cambridge, etc. I am very grateful. I like the way they operate, it’s innovative. I haven’t seen such programs in other schools and faculties. This particularly applies to the fact that, within a single year, you can learn so many useful things online – said Đorđe Ogrizović, the best student in his generation at the 3rd Belgrade High School. His colleague from the Stanković Music School in Belgrade, is also grateful for the opportunity. I am really proud of the fact that in our country we have a company like LINK group, which provides opportunities for young people. This proves that one can succeed and attain world-class skills in Serbia – said Anđela at the reception at the White Palace. Take a look at the reception at the White Palace.